Fact: Defective Polybutylene pipe (PB) was used in manufactured homes from 1976 thru 1996. 1976 to1996 manufactured and mobile home owners this is information you should know about. This type of pipe is DEFECTIVE and is known as Polybutylene Pipe. Be consumer smart. Please read the following information and any other sources to educate yourself on this defective pipe. We are specialists in removing and replacing defective polybutylene pipe, with complete repipes, also providing professional repair of damages caused to your manufactured or mobile home, due to the defective polybutylene pipe. Over 30 years experience ... specialists since 1984! Fact: Defective polybutylene pipe (PB) was used in manufactured homes from 1976 through 1996. From the mid 1980’s through the 1990’s most homes never reached the point of leaking and then have the opportunity to be re-piped under the (CPRC – PBpipe.com) class action suit. Unfortunately, as more time passes the odds of a destructive water leak caused by this defective polybutylene pipe have only increased. 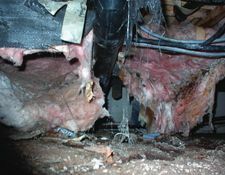 Is this defective pipe in your home? Do you know for sure? 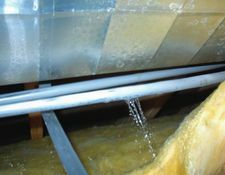 You may have moved into a home unaware that it had this type of water pipe system installed. How can you tell if you have the defective (PB) polybutylene pipe in your manufactured or mobile home? See the photo above. 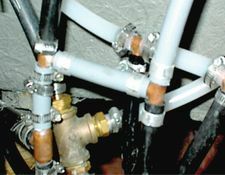 The type of pipes shown in the photo are real life visual examples of defective polybutylene pipe systems. This pipe can also be identified as being thin, gray or black plastic pipe; with plastic, brass or copper insert fittings; that are fastened by metal crimp rings, both aluminum or copper. It can also be found under sinks, toilets and in hot water heater areas. Unfortunately, most mobile homes and park models manufactured from 1976 through 1996, almost exclusively, used this as their main water supply system. Why should you ask yourself these questions and check your plumbing? These pipes can develop pin hole leaks or even splits. The crimp rings or fittings can break, crack or weaken and most of the time this goes unnoticed to the homeowner for some time. Often the small leaks (mist) are not even realized until water shows up somewhere noticeable or the floors begin to warp. Major breaks (often under high pressure) can occur when you are sleeping or away from home, causing major damage to your floors, walls, furniture, vapor barriers and insulation. What is the reason for publishing this information? For years we have heard homeowners, after experiencing a problem, express, “Why didn't anyone tell me about this pipe? There needs to be information available on this (PB) pipe.”. However, the facts are that much information has been available to the public. We hope this information here on our website contributes to that and helps other homeowners avoid future costly repairs by failing to remove the defective polybutylene pipe from their home before a destructive water leak occurs. We can help you identify and remove defective polybutylene pipe in your home. Since 1994 Courtesy Manufactured Home Plumbing & Repair has gone state wide in Arizona re-piping 1000’s of manufactured and mobile homes under the (CPRC) class action suit. Please note: the reimbursement funding for the (CPRC – PBpipe.com) class action suit has ended. However, we offer professional quality repiping and plumbing services, with over 30 years experience, at very reasonable rates.